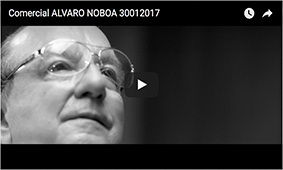 Alvaro Noboa, in the interview realized by Alfredo Pinoargote in Contacto Directo (Ecuavisa), received many questions regarding his relationship with his nephews Luis Noboa y Antonio Noboa. The PRIAN leader showed a lot of emotion in front of the cameras when he talked about his family. And he let know the viewers about his closeness with Luis and Antonio, in which he carries the role of father figure for them. We share with you an excerpt from the interview realized on September 6th 2012, which was broadcasted by Ecuavisa. ÁLVARO NOBOA: Lucho has a conversation with me, they talk to me like when you talk to your children, when they seek to be this or that they seek me, he tells me, look… I am resident in the United States, and the residence is in conflict with me being Assemblyman, because the American authorities are saying that as well if I am a resident here all the time. So we agreed that if he could do it according to the Constitution of the United States and the Ecuadorian constitution is to run as Assemblyman for New York as an immigrant in other words Ecuadorian immigrant or resident in the United States. ALFREDO PINOARGOTE: But is this already solved? ÁLVARO NOBOA: And I accepted it. ALFREDO PINOARGOTE: Now his attitude, he visited on August 20 with Barcelona at Carondelet, were in the changing of the guard, had lunch with the President. And Barcelona will be champion in two months before the election and now he decides their situation as President of Barcelona is to abstain from any political situation. 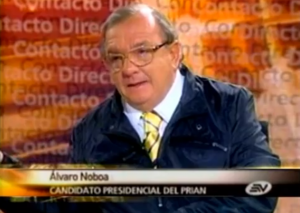 ÁLVARO NOBOA: This is not what he said to me, I have to answer for what they say to me. He and Toño, Antonio Noboa, his brother, did not consult me, I was out of the country, I looked at the visit where the Economist Correa and my advice would have been not to go, because Correa made Toño to quit the Congress in the year 2006, how can you go to see a executioner and shake his hand, go to lunch with him. Then Toño who is forgiven because one forgives the children and they are like my children, Toño was wrong to go see and Correa and Lucho was wrong to go to join him.